Technical Car Experts Answers everything you need: No air flow through the front air vents on Pontiac Montana? No air flow through the front air vents on Pontiac Montana? You might want to check the cabin air filter they can get pretty nasty. if they get plugged up no more airflow. You might also wast to check your vacuume lines under the dash, you might have a vent door not opening. The cabin air filter located behind the access panel inside the glove box. The mode actuator is located on the right side of the dash, attached to the LEFT side of the HVAC case.. The HVAC filter is the one in the glove box. Remove the knee bolster from the instrument panel. Disconnect the mode actuator electrical connector. Important: Count the number of threads showing from the tip of the mode actuator push rod to the end of the retainer clip. Open the mode actuator push rod retainer clip (1) with a small flat bladed screwdriver. Disconnect the mode actuator push rod (2) from the retainer clip (1). Important: Disconnect the IP wiring harness clip from the IP support bracket to help access the mode actuator screws. Disconnect the IP wiring harness clip from the IP support bracket. Remove the mode actuator mounting screws. Remove the mode door actuator. Also, try adjusting the treaded part of the actuator rod (2nd picture) by disconnecting it and moving up or down in the clip to see if you get better airflow from the defrost vents. Depending on which side of the dash you were to take apart, it would be the lower trim peice. For instance, on the driver side, it is the bog plastic panel that goes from under the steering column, down to the bottom of the dash. 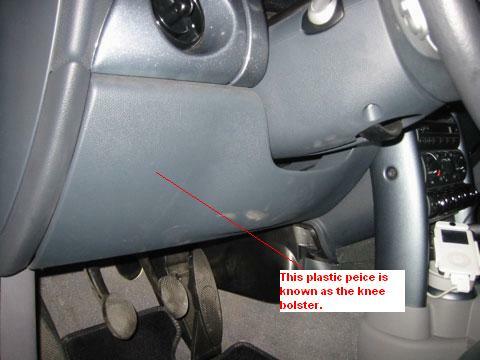 The bottom portion of the dash, both sides, is the knee bolster. If you remove the left side panel, and look to the right you should see it. There should be a door that controls that in the HVAC box where you found the rear blower motor.It may be controlled with an electric actuator instead of a vacuum valve.If you can gain access, remove the actuator and manually work the door to be sure it is ok.Also try with a/c to see if it will flow out of the upper vents. Labels: No air flow through the front air vents on Pontiac Montana.